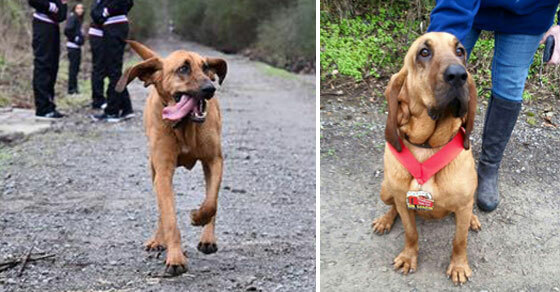 While the vast majority of us can’t claim to have accidentally run a half marathon, two-and-a-half-year-old bloodhound Ludivine just did exactly that. Prone to exploring Elkmont – the small town where she lives – by herself, when her owner April Hamlin let her out for a wee, Ludivine slipped out of her garden, and found her way (by chance) to the start of a half marathon. Enthusiastic, excited by all the activity, Ludivine then proceeded to run the whole 13.1 miles along with the actual competitors. But Ludivine didn’t get tired. She finished the race, coming in seventh. Owner April didn’t find out what Ludivine had been up to, until her friends spotted the dog, wearing a medal, at the end of the race.